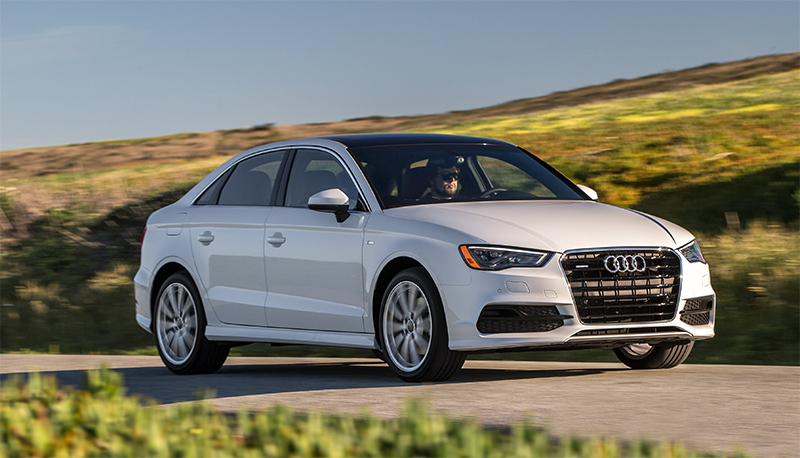 Audi of America introduces the all-new 2015 Audi A3 Sedan with both the 1.8 TFSI® and 2.0 TFSI® powertrains. The premium compact sedan offers the latest in progressive technology at a competitive price, without compromising on luxury, design or performance. The base MSRP for the Audi A3 1.8 TFSI will start at $29,900 and the 2.0 TFSI® will start at $32,900. The A3 Sedan will bring to the entry premium market new innovative technologies and the detailed craftsmanship found in larger flagship Audi sedans. The Audi A3 Sedan features standard leather seating surfaces and exceptional ergonomics, and offers the signature Singleframe® grille, ultra-thin retractable MMI® display, available Audi drive select, 4G LTE connectivity and Bang & Olufsen® audio. The A3 Sedan will also come equipped standard with a panorama glass sunroof and bi-xenon headlights. In addition to the base premium package, two iconic Audi luxury packages are offered on the A3 Sedan – Premium plus and Prestige. Premium plus will include exclusive 18″ 10-spoke-design Audi wheels, an aluminum interior package, and keyless entry for an additional $2,550. The Prestige package will include everything that is offered in premium plus, and will give the A3 Sedan a sportier look with the S Line® exterior kit. It will also offer the Driver Assistance package, Bang & Olufsen Sound System, Audi MMI navigation plus, Audi connect®, Convenience package and full LED headlights for $8,450. The A3 Sedan will be joined later in 2014 by the recently announced Audi A3 Cabriolet, A3 TDI® clean diesel, the high-performance S3 Sedan and in early 2015, the A3 Sportback e-tron® gasoline electric hybrid (PHEV). The exterior of the A3 Sedan has been completely redesigned and specifically tailored to meet the sedan preferences of the American market. • The Audi A3 Sedan stretches 175.5 inches in length and has a 103.4 inch wheelbase. Combined with its 70 inch width and 55.7 inch height, its proportions are compact but very sporty. • The signature Singleframe® grille and available full-LED headlights. The athletic exterior of the A3 extends inside, where Audi maintains its leading role in automotive interior design and craftsmanship. • The defining element is the “wraparound” dash design, which incorporates an innovative three-dimensional inlay concept surrounding the driver and front passenger. • The available LED interior lighting package highlights the immense craftsmanship and attention to detail. 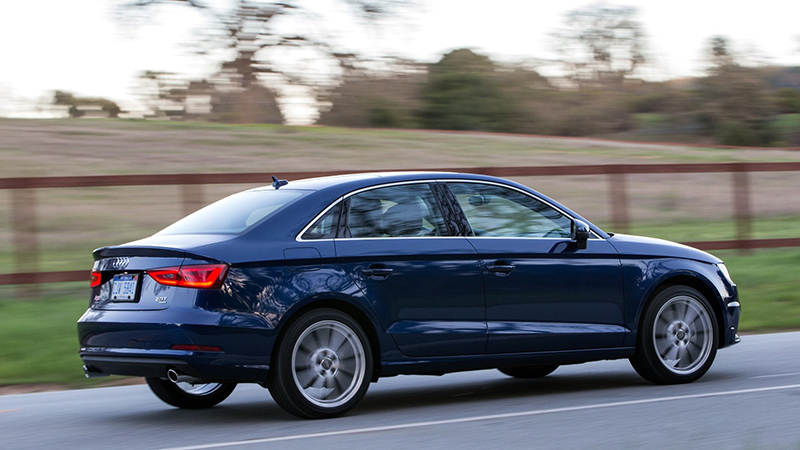 The Audi A3 breaks the boundaries and raises the bar as to what is expected out of entry-level luxury vehicles. • The A3 marks the first time that an A-segment vehicle will offer MMI® technology, Audi drive select, 4G LTE connectivity and Bang & Olufsen® audio. • The MMI operating system has an electronically extending screen, its terminal housed in the console of the center dashboard. They now offer a touch pad incorporated into the rotary MMI control wheel, which offers an intuitively and simple operation typical of the brand with the four rings. • NVIDIA graphics processing unit (GPU) – generates complex three-dimensional images used in all online, voice control, media navigation and telephone functions. • A 705 watt 14-speaker Bang & Olufsen Sound System is optional on the A3 Sedan. 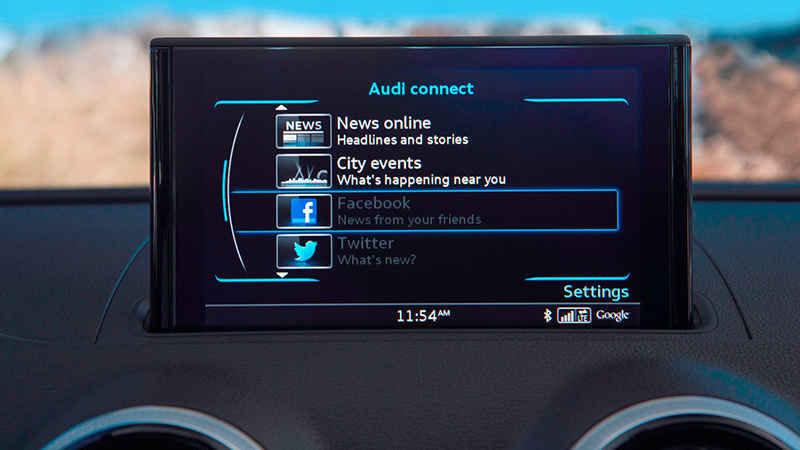 The modular infotainment platform in the Audi A3 also brings several upgrades to the industry leading Audi connect® service. Audi’s connected vehicle strategy targets features and services that enhance the experience for Audi drivers and their passengers by providing the benefits of access to information and content, when needed, through interfaces designed for the in-vehicle environment. • Most advanced version of Audi connect® including read aloud Facebook® and Twitter® alerts, access to more than 7,000 Internet broadcast stations, RSS news feeds and more. • The MMI navigation plus uses 4G LTE to deliver the tailored services of Audi connect to the driver – from navigation with Google Earth and Google Street View to Audi and online traffic information. • Audi connect® services, such as, text-to-speech function for e-mail and a dictation function for text messages (SMS). • An accompanying mobile app will allow advanced functionality between the MMI system and smartphones, passengers will be able to view high-definition videos and make video conference calls from the vehicle. • Audi and AT&T have teamed to offer U.S. Audi drivers the expected first-ever in-vehicle 4G LTE data connection. • Standard Audi pre sense basic system which helps detect when an emergency maneuver is being made and prepares the vehicle and its occupant restraint systems in advance of a possible collision. • Optional advanced technology package, which includes Audi active lane assist, and adaptive cruise control with stop and go. The A3 Sedan will offer impressive power and groundbreaking efficiency with two engine options including the 170 horsepower 1.8 TFSI® and 220 horsepower 2.0 TFSI. • Both engines are mated to the standard 6-speed S tronic® transmission, providing immense shifting flexibility and driving pleasure with smooth, dynamic acceleration and virtually no interruption to the power flow. • The optional Audi drive select system allows the driver to adjust throttle response, shift points, and the electromechanical steering effort. Similar to other Audi models, Audi drive select has four settings that include Auto, Dynamic, Comfort and Individual. The new platform allows the front wheels to move forward by roughly 1.5 inches (compared to the previous generation A3) to provide well-balanced proportions, supplemented by optimized interior space utilization, and an improved structure. • Front suspension is a MacPherson strut design with A-arms and aluminum pivot bearings. It is joined to an aluminum subframe. • The electromechanically assisted steering system operates sensitively and efficiently together with various assistance systems, while reducing mechanical drag for greater efficiency. • In the four-link rear suspension, which utilizes a steel crossmember, the springs and shock absorbers are mounted separately. • The electronic stability control (ESC) also includes an electronic differential lock. When driving through curves, it can brake the inside front wheel very slightly to help minimize understeer and improve traction.